I got some really sad news, Vieji passed away this morning. RIP, Vieji. You’re missed already. Recibi muy malas noticias, Vieji falleció esta mañana. 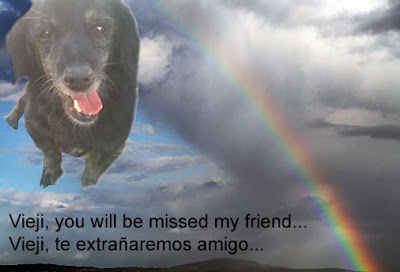 So sorry to hear you have lost a friend Girasol :o( What a beautiful picture. Sinto muito por seu amigo. I came across your blog through Paw It Forward and thought I would stop by and say Hi. Stop by my blog sometime, I like to make new friends. Also fur all the single pups out there, my brother Scooby has just started his own "business" called Lookin' Fur Love. You can find it on my blog. We're so very sorry to hear about Vieji, Girasol! It's so hard to lose a friend! I have added you to my friends list so I can stop by more often, I hope thats ok? Oh how sad.. We send our best heeler vibes to the family..
Girasol, es una foto bellísima. Nos has emocionado a Ovejita, al Tito Jose y a mí. Yogui: preciosa tu meditación sobre mi hermanito Vieji: corriendo detrás de uno de los colores del arcoiris... Me has emocionado. Lorenza: agradecemos profundamente tus oraciones. Sabemos que nuestro hermano Vieji estará muy reconfortado en el Cielo. Muchas gracias a todos por vuestras reconfortantes palabras. Lametones de Pelayo y Ovejita.